This report is based on a fireside chat meeting between Josh Green, Panjiva’s co-founder, and Congresswoman Stephanie Green held on Nov. 27 in New York looking at current and future U.S. trade policy. Text is based on commentary from Mr. Green while quotes from Congresswoman Murphy are shown separately. A transcript is available on request. Starting with first principles the trade deficit is the primary way the administration of President Donald Trump keeps track of the state of America’s international trade position. 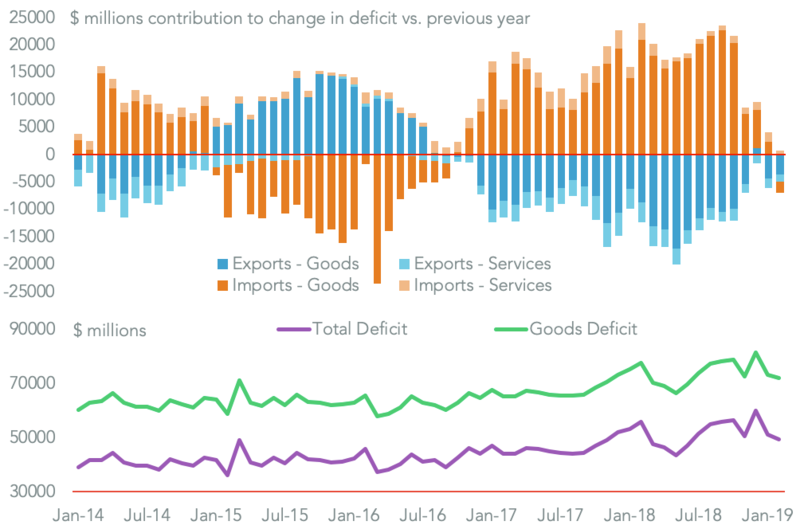 The trade deficit has in fact been growing rather than shrinking, as shown in the chart below. 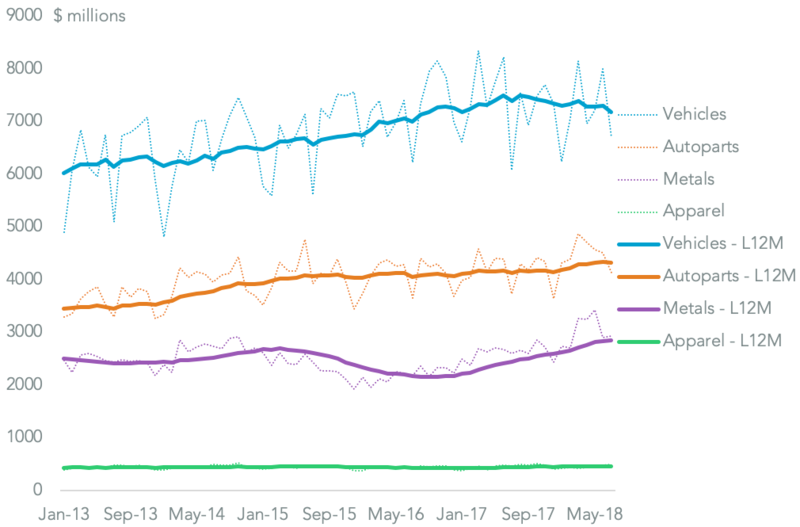 In fact the number of shipments in October hit the highest since we’ve been tracking the data – and that’s in the midst of a trade war. That growth is testament both to the resilience of the American consumer and their spending in the midst of tariffs. Second it shows a rush on the part of business to get ahead of tariffs being applied to Chinese exports. 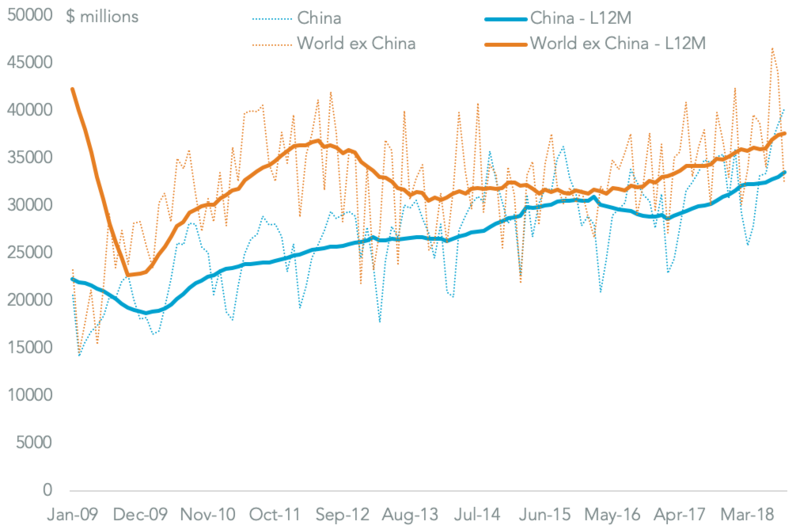 The trade deficit with China (the blue line below) has been steadily increasing. President Trump’s signature accomplishment in the first two years of the administration has been the renegotiation of NAFTA as the USMCA. NAFTA certainly needed to be updated – the internet was not a thing when it was negotiated. 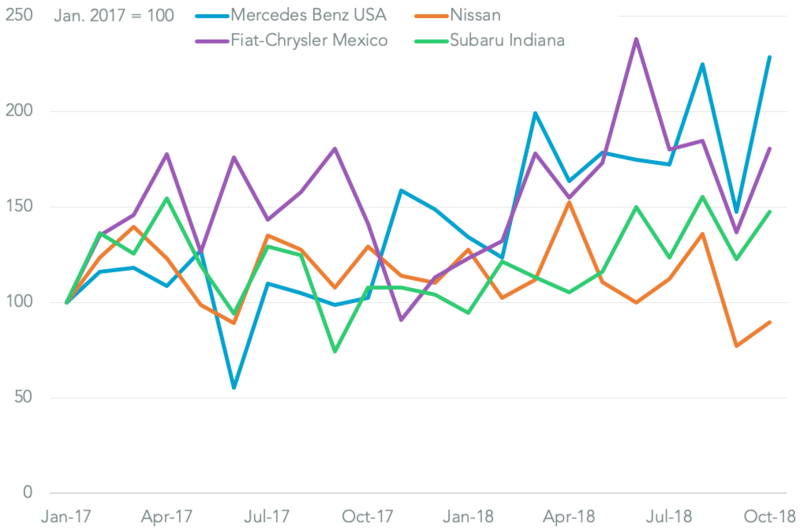 Autos also received a lot of attention – as the chart below shows vehicles are the biggest category when it comes to trade between the U.S., Canada and Mexico. 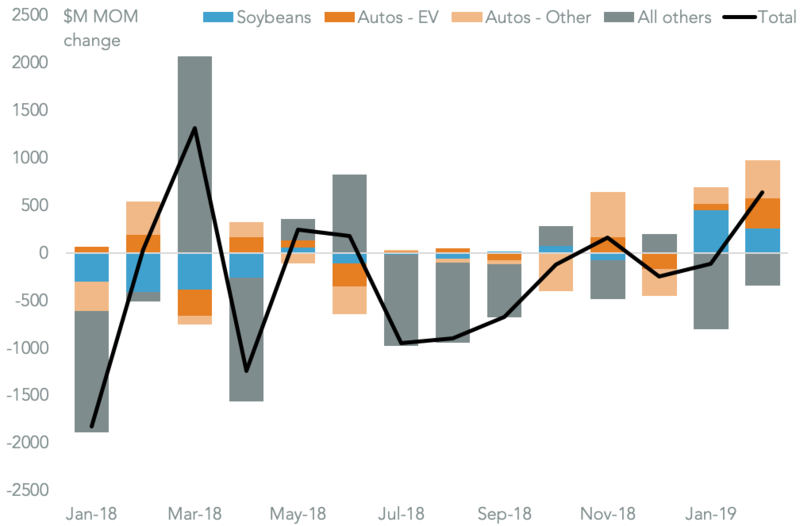 That sector will continue to get a lot of attention in areas such as the General Motors announcement outlined in Panjiva research of Nov. 27. The next stage is for USMCA to be reviewed by Congress for potential passage in 2019. 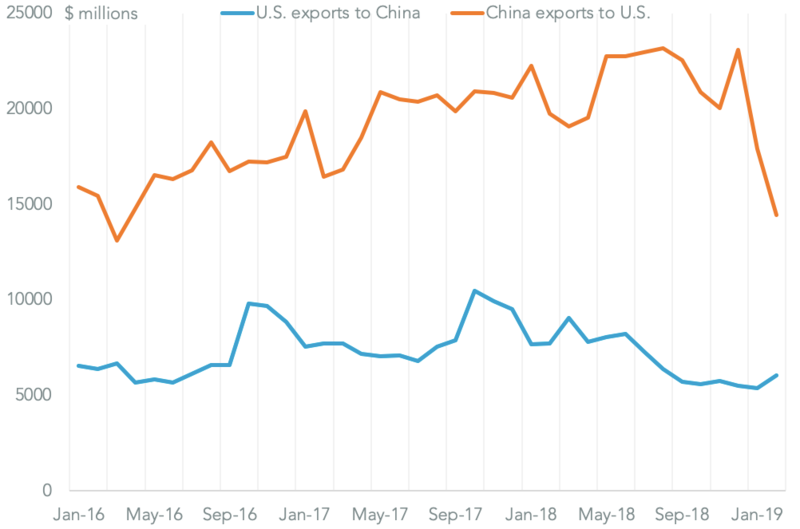 Coming back to the China-U.S. trade war there has been a pretty significant downturn in American exports to China of products that have been afflicted by tariffs. 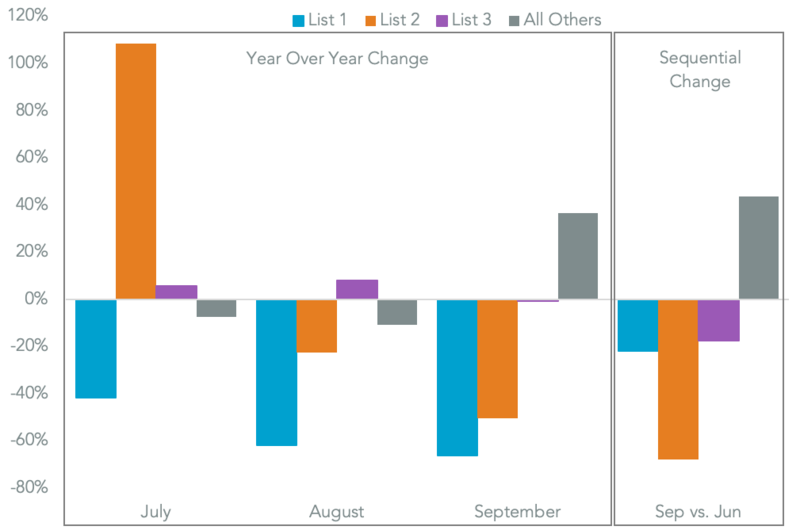 The blue bar in the chart below shows what has happened to products that were affected by tariffs in July while the orange shows the August round. 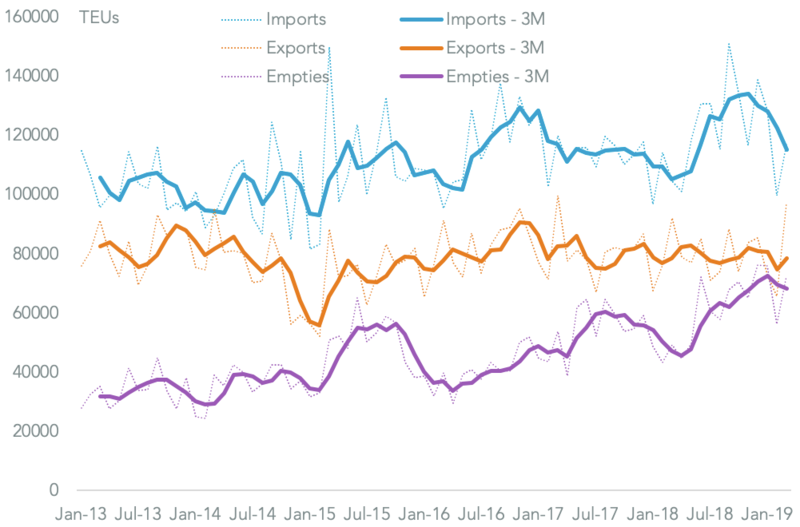 You can see the rush to get ahead of tariffs and subsequent slump in shipments. One interpretation is that China, but the virtue of the way the economy is run, can actually directly affect buying decisions that result in numbers like these. The challenge for executives is to figure out what to make of the tariff what and what is going on as a result of the different trade battles. The chart below shows auto companies that import to the U.S. from China and what they are doing. Some are decreasing their imports as they don’t know what to make of the economic landscape. Others are increasing to hedge against the risks of short-term changes. However, it has become very hard for executives to make decisions even in the short-term. The defining characteristic of the economic landscape right now is uncertainty. 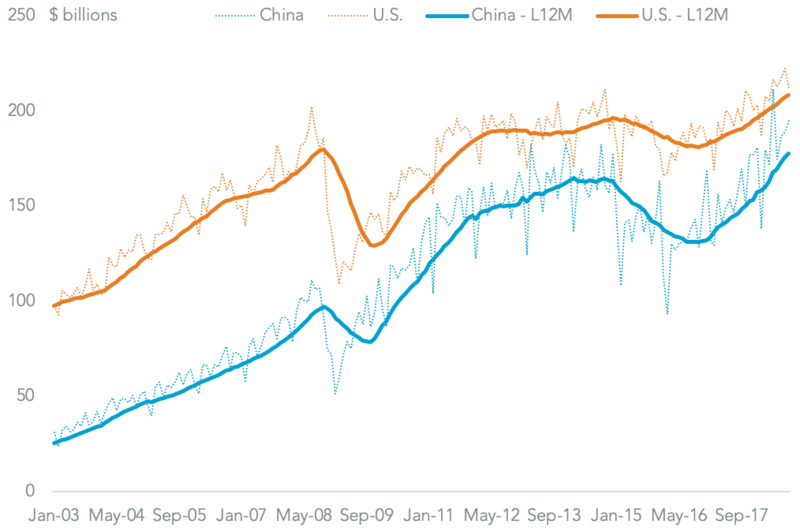 If you look further ahead there’s a clear trend where China is catching up with the U.S. as a large importer. Historically the U.S. has been the largest buyer of products globally, but what the chart below shows is that we are arriving at a trade singularity within the next five years when China will become the largest.